This is my kinda meal! It’s summer, which means it’s hot–and we’re having a hotter than average summer in Vancouver this year. I’ve not spent much time in my kitchen at all. For dinners, I’m relying on things that are quick, easy, and require a minimum of stove time. This dish is absolute perfection. 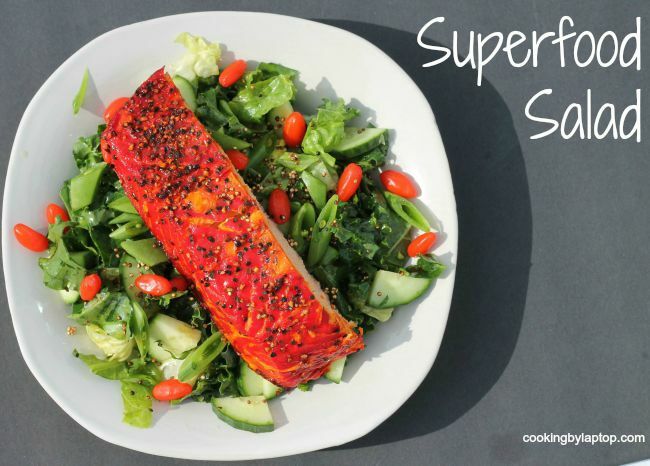 There is literally zero cooking involved (unless you want to cook your own salmon, which is perfectly acceptable), and it is packed with all the superfoods. Oh, yeah! If you ate this every day, you’d probably live to be 104. I should say that this is the first time I’ve experimented with fresh goji berries. Like many of you, perhaps, I’ve used the dried ones in recipes sometimes, pretty much anywhere you’d use a dried cranberry or a raisin. They’re great in granola bars, trail mixes, cookies, muffins or energy bites. But this is the first time I’ve used them fresh. I’m pretty excited about these particular ones. You see, gojis usually come from Asia, but these ones are grown right here in BC! Yay for local superfoods! These ones come from GoJoy, and I believe they are the only local producers of this superfood, which have the highest protein count of any fruit. A relative of the nightshade family (they do look like teeny grape tomatoes, don’t you think? ), they are packed with vitamin C, have ore carotenoids than even carrots, are high in fibre, and 15 times the amount of iron found in spinach! I’m looking forward to experimenting with them some more. Okay, let’s get on to the recipe! Place all the dressing ingredients in a mason jar, screw on the lid, and shake well. Place the lettuce and kale in a large bowl, and toss well with the salad dressing. Place a handful of the greens on the plate, and then sprinkle over the peas and the cucumbers. Place the salmon on top, and garnish with a sprinkle of popped quinoa.